Comprehensive review of Optimized Retinol 2.5% Serum. See how this retinol cream compares against other wrinkle creams! 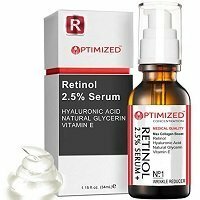 Optimized Retinol 2.5% Serum is a good retinol serum to help plump up the skin and even out tone and texture of the skin. The texture and feeling of this retinol serum is thick when it’s first applied, but as you rub it into your skin, it thins out and spreads across the skin very easily. Because the product comes in a bottle with a pump, it’s really easy to apply. All you will need to cover the face and neck is about 2 pumps of serum. Even though this is a pricey retinol serum I think because you need so little, it will last a long time which makes the price worth it since it really does work. After using Optimized Retinol 2.5% Serum for a long period of time, my skin tone and texture began to improve. It helped plump up my skin and I was noticing a difference in my fine lines around my neck and face. The only down sides I experienced were a bit of redness and flaky skin, which went away the longer I used it. Overall, Optimized Retinol 2.5% Serum works well to target fine lines and help plump the skin for a more even skin texture. The texture and feeling of Optimized Retinol 2.5% Serum feels very thick and gel like when you first apply it onto the skin, but as you work it into the skin, it quickly changes and feels thin and spreads out nice and even. Optimized Retinol 2.5% Serum is very easy to apply; the serum comes in a bottle with a pump applicator which makes it easy to control the amount of product being dispersed. You only need a few pumps to cover the entire face and neck; I’d suggest about 2 pumps. If you want to put it on your chest as well, you’ll need another pump. Optimized Retinol 2.5% Serum dries very quickly and absorbs right into the skin; it only takes about 15 seconds to dry to down. Once the serum is dry, you can’t feel it on your skin at all which I really like. Something I like a lot about Optimized Retinol 2.5% Serum is that there is virtually no smell to this product. There is definitely no fragrance added at all. After using Optimized Retinol 2.5% Serum for a short period of time, my skin was a little bit dry and flaky for a few days. After using Optimized Retinol 2.5% Serum for a longer period of time, it helped plump my skin quite a bit! I was impressed with how much it helped with fine lines, hyperpigmentation, and the overall tone and texture of my skin. Although it did help a lot with fine lines, it didn’t help as much with the deeper wrinkles on my face. Optimized Retinol 2.5% Serum has a lot fewer ingredients than many other retinol serums. Some of the interesting ingredients in this serum are Sodium Hyaluronate, Natural Plant Glycerin, and Dl-Alpha Tocopheryl Acetate. Sodium Hyaluronate is the salt form of hyaluronic acid, which is used to help with anti-aging by locking moisture into our skin. The moisture helps with plumping and restoring fullness to our skin where volume has been lost. Natural Plant Glycerin is also a moisturizing agent. It works to lock moisture into the top layer of our skin while the oils it contains work their way down into our skin to leave long lasting moisture and plumped up skin. Dl-Alpha Tocopheryl Acetate is the most stable form of Vitamin E in skincare products. It’s used to help our skin fight off free-radicals, which in turn helps fight future fine lines and wrinkles from forming on the skin. The cost of Optimized Retinol 2.5% Serum is $19.50 for 1.15 oz of product which comes to $16.95 per oz. This is about an average cost for a retinol serum. Unfortunately, I couldn’t find a money back guarantee for Optimized Retinol 2.5% Serum. To buy Optimized Retinol 2.5% Serum, click here. Ingredients Vitamin E is good to fight off free radicals from the skin.